Thank you to our 8 gateway partners, who shared the latest local insights across 15 countries, at this year’s World Telemedia in Marbella, Spain. Pictured is Medhat Karam from ARPU/ T-Pay, who gave an overview of the Middle East and North Africa region, with a special focus on UAE, Qatar and Egypt. Medhat shared his local knowledge with 50 delegates, and the Empello seating area was full to capacity with many of the audience standing up for the briefing. 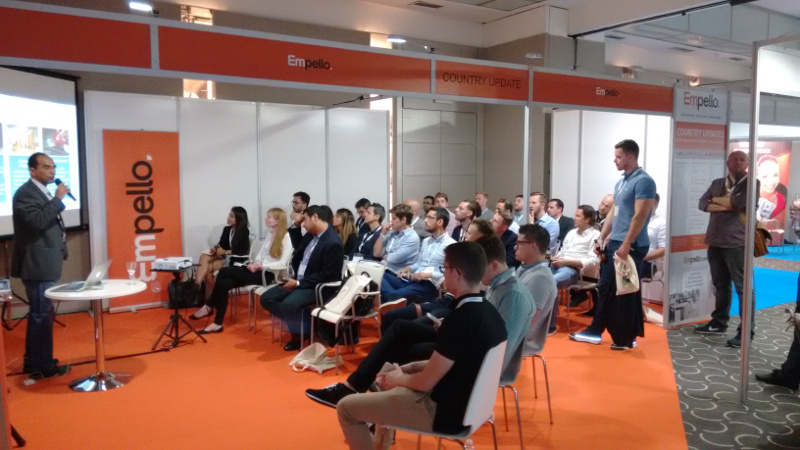 In parallel to the market sessions, Empello Country Managers Ieva and Ola demonstrated our monitoring portal, and showed in real-time ad flow and service data from 18 markets. It was fabulous to see everyone at the show, and we are grateful to the organisers for facilitating such a great event !